We have an outstanding program with keynote speakers Dr. Richard Gallo from UC San Diego and Dr. Ronald Evans from the Salk Institute, along with Dr. Napoleone Ferrara as the WHF Hunt Lecturer. And don't miss out on this year's Dinner Cruise Social around the San Diego Bay. WHS Meeting details can be found on our website, www.woundheal.org. Register for the Meeting now (Advanced Registration Discounts end Friday, February 24th). Members*! Login to the members-only page to register for your free member ticket for the WHS Social Cruise (a 3 Hour Buffet Dinner Night Cruise in the San Diego Bay). You may also purchase additional tickets on a first come-first serve basis for non-member guests ($95/person for family and colleagues; children 3 and under free). Visit the Wound Healing Society Online Store and order your WHS shirts, jackets and caps by Saturday, February 25th for home delivery in time to wear at the meeting. Stay warm in your new WHS jacket while cruising around the San Diego Bay during the Members Only Social. *For any non-member colleagues interested in the Social Cruise, get all of the benefits of membership including the WHS Social, but seating is limited, so JOIN NOW! 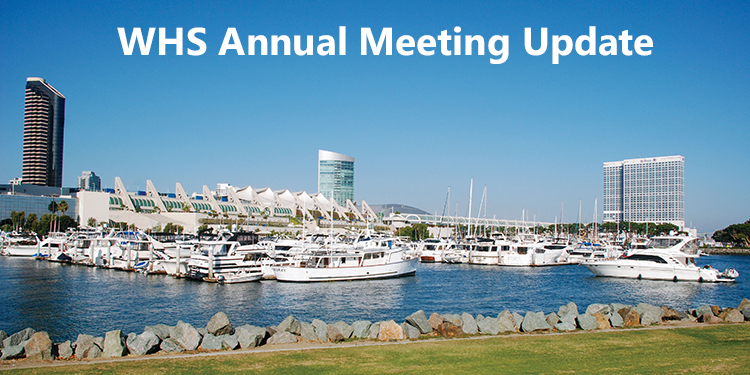 We look forward to seeing all of you in San Diego, where science meets the surf! Wound Healing Society Online Store Now Open! Members, this is a great opportunity to show your support of the WHS. Visit our new online store and order your WHS jacket, shirts and caps. There are several different styles and colors to choose from. Don't hesitate! If you want to wear your gear proudly at this year's Annual Meeting, orders must be received by Saturday, February 25th for home delivery in time to pack. Orders may still be placed after February 25th, but with no guarantee to arrive before April 5th. Shop now and show your support! As you may know, the Wound Healing Foundation (WHF) is a public non-profit organization dedicated to improving the field of wound healing through a variety of educational, research, and outreach programs. We are entrusted with funding a variety of grant opportunities for new and established researchers. In 2016, up to $50,000 in grants and scholarships were awarded by the WHF. The Foundation also coordinates and hosts several global lectures and networking opportunities, including the WHF-Thomas K. Hunt Endowed Lecture, the WHF-3M Fellow Lecture and the coveted Fellow and Hunt lunches at our annual meeting. We invite you to get involved and connect with our wound healing medical healthcare and research colleagues across the globe through our social media and with patients, through our new online support forum. See our brief list below of upcoming grant deadlines, educational events, and a volunteer opportunity, too! As an outgrowth of the efforts of Gerald Lazarus, Rob Kirsner and David Margolis who spearheaded the Venous Ulcer Forum that culminated in the recent WRR article "Clinical Interventions for venous leg ulcers: Proposals to improve the quality of clinical leg ulcer research", the WHS and AAWC plan to formulate a joint venture between the two premier societies focused on wound research. The solitary goal is to improve clinical research in wound healing. Stay tuned for further updates. NINR has launched a new website called "Stories of Discovery" https://www.ninr.nih.gov/all-stories-of-discovery. This website features several stories, including wound healing and prevention, as well as ongoing studies at Ohio State and Georgetown University. Make sure to check out the featured "Healing" article, where WHS President, Dr. Marjana Tomic-Canic's lab's work on microRNA is discussed.